Which Ford would you like to optimize? Check out the power your Ford could produce. Unfortunately not available for your car. By choosing RaceChip S your current selection will be discarded. By choosing RaceChip RS your current selection will be discarded. By choosing RaceChip GTS your current selection will be discarded. By choosing RaceChip GTS Black your current selection will be discarded. State-of-the-art for high-performance vehicles. The combination of ultramodern hardware, cutting-edge software and technology (up to 7 analogue and digital channels) plus comprehensive safety and service packages gives petrolheads everything they’ve ever wanted in their own cars. Experience the intense joy of driving on challenging cross-country roads, the thrill of commanding acceleration away from traffic lights or the confidence inspired by ample power on the autobahn - all roads lead to RaceChip GTS Black. The RaceChip app lets you choose from three expertly matched tuning stages: Efficiency for minimising consumption in the city, Sport for strong acceleration between the corners on cross-country roads, and Race for maximum performance. Engines should be asked to produce full performance only after they’ve reached working temperature. The Warm-Up Timer feature integrated into RaceChip GTS Black makes sure the engine is ready to really deliver – it makes the full power increase available only once the engine is properly warm, which will also increases your car’s lifetime. 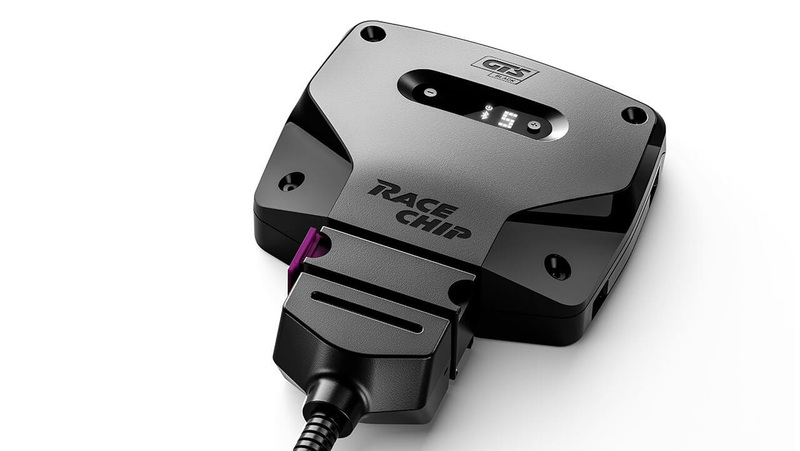 RaceChip GTS Black comes to you with the right mapping for the engine in your car. You can also use the Digital User Interface to tune the GTS Black yourself to the engine’s performance and characteristics. The 7 finetuning mappings mean the RaceChip and the engine can be matched perfectly, without effort and without tools. Images for illustration only. Actual parts supplied may differ depending on vehicle. The premium chip. The combination of the latest hardware coming from the automotive industry, a completely new optimisation software with enhanced engine-specific adjustments, and a comprehensive service and safety package is a very convincing proposition. Engineered for a delightful driving experience. RaceChip GTS comes to you with the right mapping for the engine in your car. You can also use the Digital User Interface to tune the GTS yourself to the engine’s performance and characteristics. The 7 finetuning mappings mean the RaceChip and the engine can be matched perfectly, without effort and without tools. The bestseller. A completely new optimization software with enhanced engine-specific adjustments, high-quality hardware as well as a comprehensive service and warranty package will make every driver’s heart beat faster. The RaceChip app lets you choose from three expertly matched tuning stages: Efficiency for minimizing consumption in the city, Sport for strong acceleration between the corners on cross-country roads, and Race for maximum performance. RaceChip RS comes to you with the right mapping for the engine in your car. You can also choose from 6 fine tuning mappings via the rotary control on the front side in order for the chip to gradually better fit the engine’s performance and characteristics. The base chip. Latest hardware coming from the automotive industry, engine-specific adjustments, comprehensive services and warranty offer the perfect package to chip tuning first-timers. RaceChip S comes to you with the right mapping for the engine in your car. You can also use the rotary control to choose from 5 fine tuning mappings in order for the chip to gradually better fit your needs as well as the engine’s performance and characteristics. If you are looking for the best possible way to activate your vehicle's power reserves, then all paths lead to the Ultimate chip. Enjoy the absolute highest degree of acceleration, drive and dynamics. With a processor that's perfectly fine-tuned to modern engines, premium components and a comprehensive service and safety package that includes a two-year engine warranty, Ultimate offers the ideal combination for a one-of-a-kind driving experience. Whether curvy country roads, accelerating at a traffic light or zooming along the motorway, you'll love the feeling. The Ultimate software, which is specially designed for your vehicle, optimizes your engine's electronic signals. In this way, your vehicle's available power reserves are utilized optimally. Feel for yourself more power, dynamics and drive. You won't recognise your car! With the Ultimate you can increase your power considerably and save fuel and money. Up to one liter less fuel per 100 kilometers is possible. Torque optimization is the key to this success. The equation is pretty simple: more torque = earlier upshifting = less fuel consumption = lower costs. Experience a whole new level of chip tuning with RaceChip Ultimate Connect. With this innovation from RaceChip you can activate various performance optimization levels via your smartphone along with a long list of other benefits. More under RaceChip app. We deliver our Ultimate with an optimization that is specially tailored to your engine. If you want a fine adjustment of the power enhancement, however, with the Ultimate you can manually adjust the exact characteristics of your desired power enhancement so that it perfectly suits your needs. We are 100% certain of the quality of the RaceChip Ultimate. You'll benefit from the 2-year RaceChip engine warranty, which covers all of the major engine and power train components. This means that you'll always be on the safe side. The RaceChip engine warranty is available in the following countries: Austria, Belgium, Denmark, Finland, Germany, Italy, Luxembourg, Netherlands, Norway, Portugal, Spain, Sweden, Switzerland and United Kingdom. We only use premium components in the Ultimate. The complete circuit board has a nano-coating. The processor was specially designed for operating conditions in a car. The housing is heat-resistant, and the connection is made with a professional FCI plug. The Ultimate embodies the very highest quality, which is why we offer a 5-year product warranty. You don't have to be an expert to install the Ultimate. Easy DIY installation in just a few minutes – that's the RaceChip Plug&Drive promise. You can use even the most sophisticated technology with maximum ease. Of course, the Ultimate also has all the other qualities that distinguish RaceChip. The optimization software has undergone a series of examinations and test runs specifically for your engine. Our Engine Protect System Plus ensures that the increased power is always used only within your engine's RPM tolerance range. Naturally, we only use the highest quality components. award-winning, modern chip tuning product. Irresistible drive on long stretches, dynamic acceleration round bends: if that's what you like, then you'll love our best-seller, the Race Chip Pro 2. Experience your vehicle in a more intense and emotional way at all RPM levels with clearly optimized power and more torque. Benefit in certain situations from more active safety with greater power reserves. The RaceChip Pro 2 offers an overall package that you'll love. With premium components, our latest software specially designed for your vehicle and a comprehensive service package that includes a 1-year engine warranty. You'll get all of this at an unbeatable value for money. The software in the Pro 2 is specially designed for your vehicle to optimize your engine's electronic signals. This provides a significant boost to your horsepower and torque within the available power reserves. You'll feel the added power, dynamics and drive. With RaceChip Pro 2 you can increase power while also saving fuel and money. Up to one liter less fuel per 100 kilometers is possible. Torque optimization is the key to this simple equation: more torque = earlier upshifting = less fuel consumption = lower costs. We are 100% certain of the quality of the RaceChip Pro 2. You'll benefit from the 1-year RaceChip engine warranty, which covers all of the engine and powertrain components. This means that you'll always be on the safe side. We only use premium components in the Pro 2. The complete circuitboard has a nano-coating. The processor was specially designed for operating conditions in a car. The housing is heat-resistant, and the connection is made with a professional FCI plug. The Pro 2 is a high quality product, which is why we offer a 5-year product warranty. You don't have to be an expert to install the Pro 2. Easy DIY installation in just a few minutes: that's the RaceChip Plug&Drive promise. It lets you use the most sophisticated technology with the utmost ease. The Pro 2 also has other qualities that distinguish RaceChip. The optimization software is fine-tuned specifically for your engine through a series of examinations and test runs. Our Engine Protect System ensures that the performance improvement is always kept within your engine's RPM tolerance range. Of course, we also use only the highest quality hardware components. Components you’d otherwise only see in the premium chip tuning segment: heat resistant, fibreglass housing, a circuit board covered with a nano-coating technology for optimal moisture protection, and a special FCI plug from the automotive engineering sector. You'll get these premium hardware components with the RaceChip Pro 2 together with the latest version of the RaceChip optimization software at an attractive price and great value. Optimally utilize your power reserves and make absolutely no compromises. Don't be fooled by the attractive price of the RaceChip One. You'll still benefit from all of RaceChip's chip tuning know-how with our entry-level model. The hardware and software are specially designed for your vehicle and takes advantage of the developments in our premium products. With the One you'll already get considerably better power from your vehicle's power reserves. You'll enjoy driving pleasure on another level – you'll feel the extra power, higher torque and the ability to save fuel. The One makes driving an experience that will thrill you. The One software, specially designed for your vehicle, optimizes your engine's electronic signals. You'll get a considerable boost in horsepower and torque within the available power reserves. You'll feel more power, dynamics and drive. You'll not only optimize your power with RaceChip One, you'll also save fuel and money. You can reduce fuel consumption by up to 1l/100 kilometers. Torque optimization is RaceChip's key for a simple equation: more torque = earlier upshifting = less fuel consumption = lower costs. We are 100% certain of the quality of our Racechip One. You can benefit from the optional RaceChip engine warranty. For just N/A EUR you'll get one year of additional, comprehensive security for your car. In the unlikely event of damage, RaceChip will stand behind you. This means you're always on the safe side. Only high quality components are used in the One. The housing is heat-resistant and the connection to the engine electronics is very durable. That's why we also provide a 2-year product warranty for the One. You can easily install the One by yourself in just a few minutes. That's the RaceChip Plug&Drive promise. It makes your entry into the world of performance improvement easy and trouble-free. The One has many of the other quality features typical of RaceChip. The optimization software is specially designed for your vehicle through a series of examinations and test runs. Our Engine Protect System Plus ensures that the increased power is always used only within your engine's RPM tolerance range. And of course, we only use high-quality hardware components. We are 100% certain of the quality of our products. You'll benefit from the RaceChip engine warranty (optional for the One but including with the Pro 2 for 1 year and for 2 years with the Ultimate ). For just N/A EUR you'll insure your vehicle for an extra year. In the unlikely case of damage, RaceChip will stand behind you. We developed RaceChip XLR to increase responsiveness on the road. Our innovative throttle tuning system lets tune your engine’s reactions to your taste – choose from 7 separate stages. You’ll love your car’s improved dynamics – we promise. The Brainbox monitors and controls all the processes involved in optimising throttle response. RaceChip XLR can be controlled conventionally using a newly designed Controller which is connected by wire to the Brainbox. The driver can use the Controller to select any of the tuning stages at any time. RaceChip offers you the option of controlling XLR right from the RaceChip app running on your smartphone. RaceChip XLR communicates with your phone via Bluetooth. An app ahead with RaceChip. The future of chip tuning. The RaceChip app lets you set up your car as you want; just select the tuning stage from your smartphone. The app can also deactivate the RaceChip, returning the car to stock tune. App control for your RaceChip is available for just N/A EUR. The chip communicates with the RaceChip app via Bluetooth and enables you to easily control the performance increase by choosing between 3 tuning modes from your smartphone: Efficiency for saving fuel in urban traffic, Sport for improved mid-range flexibility on open roads, Race for maximum performance. Use the RaceChip app to choose between 3 tuning modes; Efficiency for saving fuel in urban traffic, Sport for improved mid-range flexibility on open roads, Race for maximum performance. It’s better for the engine if it is allowed to warm up properly before being asked to deliver maximum performance. The warm-up timer puts the upgraded performance on tap only after the engine has reached working temperature, reducing wear. The RaceChip comes from the factory with the right map for your engine. Should this initial configuration not meet your expectations, our customer service is able to further adapt the settings of the 3 distinct driving modes Efficiency, Sport and Race to the performance characteristics of your engine. The new parameters will then simply be transferred from the app to your RaceChip. The RaceChip app means you can download the latest version of our optimisation software. The app installs it on the RaceChip automatically. The RaceChip app and our service features allow us to re-calibrate the fine tuning mappings according to your wishes and even to change the optimisation software completely if necessary. The changes are all transmitted by the app to your RaceChip. Combine chiptuning and throttle tuning to maximise driving enjoyment. Both devices can be controlled from the app. The RaceChip app is compatible with all Apple smartphones and tablets supporting Bluetooth 4.0 and running iOS 7.0 or later. The RaceChip app is compatible with smartphones supporting Bluetooth 4.0 and running Android 4.4.2 (KitKat) or later. Some Huawei and Honor devices running Android 7 (Nougat) can currently experience connection problems. Some devices with Android 6.0 (Marshmallow) without an update to Android 6.0.1 (Security Patch 01.10.2016) do not allow for a connection with the module at the moment. Please contact our customer support and we will inform you as soon as the feature is available. The installation in your car is unfortunately somewhat more difficult. With our installation instructions however, you will have the perfect guide. You will be led step-by-step through the installation. If you have any questions, please contact our customer support at any time. In extreme cases, we recommend having the installation performed in a workshop. The RaceChip app is compatible with all Apple smartphones and tablets supporting Bluetooth 4.0 and running iOS 8.0 or later. Some devices with Android 6.0 (Marshmallow) without an update to Android 6.0.1 (Security Patch 01.10.2016) do not allow for a connection with the module at the moment. In case you are interested in this product and use Android 6.0, please contact our customer support and we will inform you as soon as the feature is available. The S increases the torque available and efficiency at the given engine speed. Therefore a higher gear can be selected, less gear-changing is necessary in general, and fuel is used more efficiently. Fuel consumption can be cut by up to % as a result. The S increases the torque available and efficiency at the given engine speed. Therefore a higher gear can be selected, less gear-changing is necessary in general, and fuel is used more efficiently. As a result, your car's MPG can be increaded by up to %. The RS increases the torque available and efficiency at the given engine speed. Therefore a higher gear can be selected, less gear-changing is necessary in general, and fuel is used more efficiently. Fuel consumption can be cut by up to % as a result. The RS increases the torque available and efficiency at the given engine speed. Therefore a higher gear can be selected, less gear-changing is necessary in general, and fuel is used more efficiently. As a result, your car's MPG can be increased by up to %. The RS increases the torque available and efficiency at the given engine speed. Therefore a higher gear can be selected, less gear-changing is necessary in general, and fuel is used more efficiently. Fuel consumption can be cut by up to 15% as a result. The RS increases the torque available and efficiency at the given engine speed. Therefore a higher gear can be selected, less gear-changing is necessary in general, and fuel is used more efficiently. As a result, your car's MPG can be increased by up to +20%. The GTS increases the torque available and efficiency at the given engine speed. Therefore a higher gear can be selected, less gear-changing is necessary in general, and fuel is used more efficiently. Fuel consumption can be cut by up to % as a result. The GTS increases the torque available and efficiency at the given engine speed. Therefore a higher gear can be selected, less gear-changing is necessary in general, and fuel is used more efficiently. As a result, your car's MPG can be increased by up to %. The GTS Black increases the torque available and efficiency at the given engine speed. Therefore a higher gear can be selected, less gear-changing is necessary in general, and fuel is used more efficiently. Fuel consumption can be cut by up to % as a result. The GTS Black increases the torque available and efficiency at the given engine speed. Therefore a higher gear can be selected, less gear-changing is necessary in general, and fuel is used more efficiently. As a result, your car's MPG can be increased by up to %. The S is supplied with the right map for your engine. 5 fine tuning mappings (selectable by rotary control) allow you to choose a map that suits your mood or the engine characteristics. The RS is supplied with the right map for your engine. 6 fine tuning mappings (selectable by Rotary Control Pro) allow you to choose a map to suit your mood or the engine characteristics. The GTS is supplied with the right map for your engine. 7 fine tuning mappings (selectable by Digital User Interface) allow you to choose a map to suit your mood or the engine characteristics. The GTS Black is supplied with the right map for your engine. 7 fine tuning mappings (selectable by Digital User Interface) allow you to choose a map to suit your mood or the engine characteristics. 1 If the price of the product for your new car is higher than for the car for which it was previously configured, an additional charge equivalent to the price difference will be incurred. For more information on reprogramming, please see our GTC. 1 If the price of the product for your new car is higher than for the car for which it was previously configured, an additional charge equivalent to the price difference will be incurred (even if the re-programming itself is free of charge). For more information on reprogramming, please see our GTC. GTS Black activates only when the engine has reached operating temperature, meaning extra protection. As one of the first international chip tuning companies, RaceChip has developed a combination of chip tuning and app. This lets you customize your vehicle's performance characteristics like never before. The combination of chip and app works easily via Bluetooth or your smartphone. You can download and get to know the RaceChip app for free. With RaceChip, you can utilize this amazing extra function for just na EUR. We developed RaceChip XLR to increase responsiveness on the road. Your engine’s performance isn’t affected by RaceChip XLR, but you can access it more immediately and directly. Experience significantly sharper responses for yourself – no waiting for the message to get through or frustrating hesitations. Our innovative throttle tuning system lets tune your engine’s reactions to your taste – choose from 7 separate stages. 2 Sport (S, S+) and 2 Race stages (R, R+) sharpen throttle response, speeding up the engine’s reaction times, making it as reactive as even a sportscar’s. 2 Eco stages (E, E+) slow down the engine’s reaction to movements of the throttle. In heavy city traffic and on long journeys, this can help you reduce fuel consumption. You can select N if don’t want or need to use XLR, and your car is back to stock tune. Unplug the wire from the throttle at the connector. Connect the Brainbox to the connector/adaptor. Mount the Brainbox on a smooth surface in the footwell. To control XLR: connect the Controller with the Brainbox, or set up the RaceChip app. Done! Now – go drive and enjoy! You can experience totally new driving sensations if you combine RaceChip XLR with one of our chip tuning modules. The extra power and torque that chip tuning brings is perfectly complemented by the immediate throttle response made possible by throttle tuning. Together, they push back the limits of driving enjoyment. RaceChip is the first company to offer throttle tuning together with app control. The combination gives you the easiest ever way of controlling your vehicle’s throttle response. RaceChip XLR connects directly with the RaceChip app on your smartphone via Bluetooth. If you already have a RaceChip chip tuning module in your car, XLR is the perfect add-on, and using them together is even easier – you can control both modules from the driver’s smartphone using the same app.